Scribo Displays offers rope barriers to control the crowds at your events. These crowd control barriers look stylish, durable and are cost-effective. They help you to ensure the safety of the attendees and participants at your events. 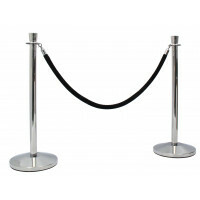 These rope barriers can be availed with poles and banners that can be used to create effective queue management systems. Customers can also choose between twisted or velvet ropes that are available in three colours. These crowd control barriers can be used to demarcate social areas and optimise the usage of retail space at your events.